In Shark Tales, Barbara shares her hilarious stories about growing up, getting into trouble, failing miserably, and then starting over again. In each chapter, she comes back to one of her mom's unconventional lessons, and how it applies in the real world of business. Whatever your calling, the homespun lessons that work for Barbara will help you use what you've got to create success in your life. 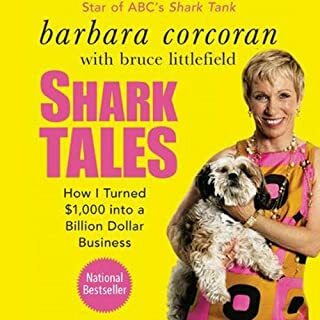 After failing at 22 other jobs, Barbara Corcoran borrowed $1,000 from her boyfriend, quit her job as a diner waitress, and started a tiny real estate office in New York City. Using 24 unconventional lessons learned from her mom, Barbara built that tiny company into a $4 billion business, and today she's richer than her wildest childhood dreams. 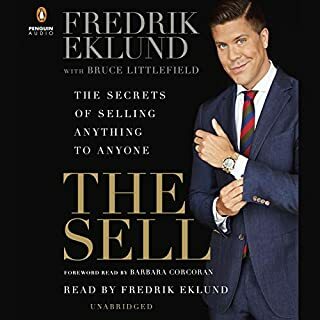 Ten years ago Fredrik Eklund moved to New York City from his native Sweden with nothing but a pair of worn-out sneakers and a dream: to make it big in the city that never sleeps. Since then he's become the top seller in the most competitive real estate market on the planet, brokering multimillion-dollar deals for celebrities, selling out properties all over the city, and charming audiences around the world as one of the stars of the hit Bravo series Million Dollar Listing New York. Many people assume that effective sales ability demands a unique personality and an aggressive attitude. It's not true, and Robert Herjavec is proof. 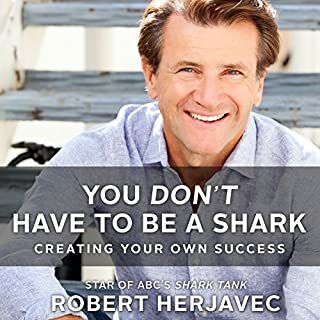 Known as the "Nice Shark" on ABC's Emmy Award-winning hit show Shark Tank, Robert Herjavec is loved by viewers, who respond to his affable nature. He has developed an honest and genuine approach to life and selling that has set him apart from his cutthroat colleagues and rewarded him with a degree of wealth measured in hundreds of millions of dollars. 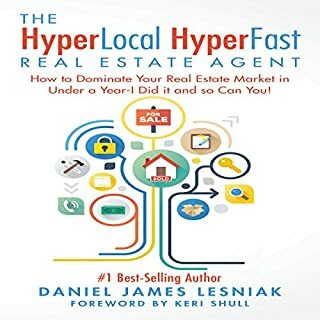 The HyperLocal HyperFast Real Estate Agent: How to Dominate Your Real Estate Market in Under a Year - I Did It and So Can You! In The HyperLocal, HyperFast Real Estate Agent, Dan tells how he used the Segmentation, Targeting and Positioning (STP) framework to identify potential markets and choose which ones to go after and how to add massive value to the consumers in that market. This book will teach you how to use the STP framework to enter new markets or increase market share in your existing markets by adding more value to your potential clients and communicating your value proposition to the market. Specific tips any agent can use in any market! Here, the FUBU founder and star of ABC's Shark Tank shows that, far from being a liability, broke can actually be your greatest competitive advantage as an entrepreneur. Why? Because starting a business from broke forces you to think more creatively. It forces you to use your resources more efficiently. It forces you to connect with your customers more authentically and market your ideas more imaginatively. From the ABC hit show Shark Tank, this book - filled with practical advice and introductions from the Sharks themselves - will be the ultimate resource for anyone thinking about starting a business or growing the one they have. Full of tips for navigating the confusing world of entrepreneurship, the book will intersperse words of wisdom with inspirational stories from the show. Learning to find great deals is one of the hardest aspects of becoming a successful real estate investor. In Finding and Funding Great Deals, seasoned real estate agent and investor Anson Young guides you through his tried and true methods for finding deals in any market. 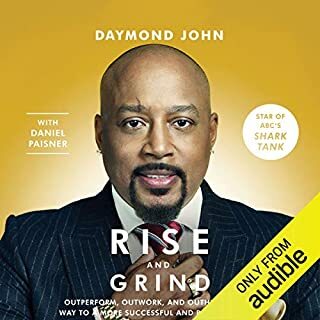 Inside this audiobook he outlines his own methods, as well as other techniques to help new and seasoned investors alike, improve their real estate business. Real Experts. Real Stories. Real Life. Whether you're a seasoned investor or buying your first property, this is the one book you can and will listen to it over and over. Robert Kiyosaki's team of real experts shows you how to: value a property, lease a property and keep it leased, get financing, title and protect entities, find hidden investment opportunities, minimize taxes, and establish your own team of advisors. The Seven Levels of Communication tells the entertaining and educational story of Rick Masters, who is suffering from a down economy when he meets a mortgage professional who has built a successful business without advertising or personal promotion. Skeptical, he agrees to accompany her to a conference to learn more about her mysterious methods. Rick soon learns that the rewards for implementing these strategies are far greater than he had ever imagined. Decent content, few gems, but tough to listen. All real estate agents share one thing in common: we're all striving to get to the next level of personal and professional success. We want to take our lives, our businesses, and our selves to the next level. What if you could get there, faster than you ever thought possible, by simply changing how you start your day? The Ultimate Social Media Marketing Guide for Real Estate Professionals! Discover the techniques that will make your real estate business grow exponentially. This easy-to-comprehend guide will teach how to navigate the roadmap of social media platforms like Instagram, Facebook, Reddit, Pinterest, Twitter, YouTube, Snapchat, and many more. An easy-to-comprehend manual that will guide you from beginning to end on what has to be done to succeed in today’s digital marketing arena. Kathleen Shannon and Emily Thompson are self-proclaimed "business besties" and hosts of the top-ranked podcast Being Boss, where they talk shop and share their combined expertise with other creative entrepreneurs. Now they take the best of their from-the-trenches advice, giving you targeted guidance on: The Boss Mindset: how to weed out distractions, cultivate confidence, and tackle "fraudy feelings"; Boss Habits: including a tested method for visually mapping out goals with magical results; and Boss Money: how to stop freaking out about finances and sell yourself (without shame). I read it all in one day. French women don't get fat, but they do eat bread and pastry, drink wine, and regularly enjoy three-course meals. In her delightful tale, Mireille Guiliano unlocks the simple secrets of this "French paradox", how to enjoy food and stay slim and healthy. Hers is a charming, sensible, and powerfully life-affirming view of health and eating for our times. Wish I had this book pre-college! Growing up, Barbara Corcoran shared one floor in a three-family house in New Jersey with her parents and nine brothers and sisters. She had few luxuries, but she was blessed with a mother who taught her to have self-confidence. Barbara's mom didn't know much about business, but she understood how the world works, and how to make the most of what you've got. After failing at twenty-two other jobs, Barbara borrowed $1,000 from a boyfriend, quit her job as a diner waitress, and started a tiny real estate office in New York City. Today, with over $4 billion in revenues, The Corcoran Group is New York's premier real estate company, and Barbara is richer than her wildest dreams. Whether you're just starting out, fighting your way up the career ladder, or reentering the workforce, the homespun lessons that work for Barbara will help you use what you've got to create success in your life. 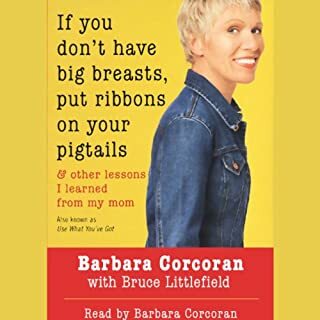 ©2003 Barbara Corcoran and Bruce Littlefield (P)2003 Listen & Live Audio, Inc. Recorded by arrangement with Viking Penguin, a member of Penguin Group (USA) Inc. I was looking for an educational book on real estate and real estate investing, however, this did not hit the mark. This book was, however, an interesting rags to riches story and entertained my wife and I during a long trip. The story is told perfectly by the author. You can almost picture the family and her wise mother! Lot's of good snippets of information in there to be had, and highly entertaining too. This book had me really thinking about different ways to use the information it offered, but laughs kept me hooked, I'll be listening to this again quite soon. My thanks to the Author, another job well done! A chuckle a minute. I can't express how much I enjoyed this book. The narration was wonderful. If you listen to this bok and are not inspired as well as entertained and touched emotionally, you are a brick. I loved it! Found this book while doing a search for titles relating to real estate. Turned out to be a long rambling story without much substance. Reminds me a lot of the Robert Kiyosaki "Rich Dad, Poor Dad" narrative but without the helpful ideas. I think that the fact that one reviewer called it Oprah-spirited says it all. This book is a fat, waste of time. great lessons, and lots of great advice. 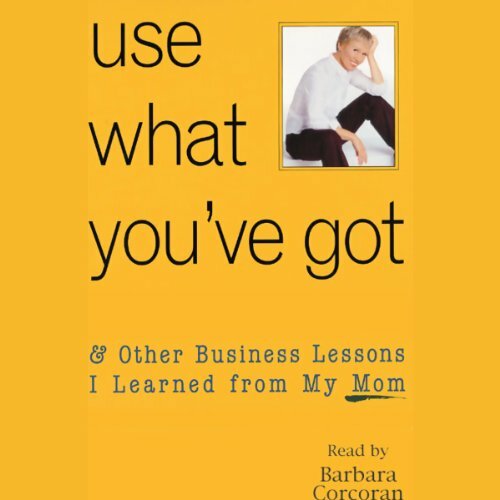 Barbara C.'s (audio)book is basically true to form of what she promises in the title.. & her book style is very consistent w/ what she writes about in her style of doing business. Very "common sense'y".. Not glamorous at all. Narration delivery is splendid.. may sound cheesy, but it's true to her "mom's common sense" simple yet classy style. The book is very honest & direct. & sweet. I love that it's perfect for young teen girls, which most business books would rarely be considered as such. Barbara does an awesome job. In audio books narration is 90% of the experience. She does a great job!! Excellent story, savvy business tips and motivation, plus the delightful reader is actually the author and protagonist... I recommend highly to everyone to read for a down home smart success story. It's filled with wonderful stories of her rise in the real estate business. Some lessons are applicable some not really. I would recommend this book, but for some light reading/listening. It's a nice break from some of the more heavy duty material out there. She does a great job narrating her book. What did you love best about Use What You've Got, & Other Business Lessons I Learned from My Mom? Satisfactory on all levels!!! Entertaining, inspirational, idea generating and valuable lessons shared. Well written and well read by the author! I loved the story of when Barbara met the would be "Condo Queen" - for Barbara's impersonations as much as the story itself! And the same for when Barbara met Donald Trump for the first time. I think the greatest lesson(s) for me may have come from the 88 condo's story. It was definitely a book I wanted to listen to in it's entirety in one sitting. It was a challenge to break-up my listening so that I could savor it! I'm looking forward to listening to it again! My first audible.com book. I am so pleased, I just ordered 3 different titles as gifts for friends and another two for my listening library. Great for the morning and evening train commute!